Giant Footprint Found In China? I love the ancient giant mystery and I know that most of you do to. So whenever I find something about ancient giants I always try cover it right away. Now what’s so interesting about this mystery is we know that our ancestors, and even the bible talk a lot about giants. And their have been some very interesting alleged discovers that might have confirmed that giants did once roam the earth. But every time an archeologist or just a random person finds a skeleton proving this, these skeletons just magically disappear. And a lot of people believe that the Smithsonian or some other dark government force is to blame. Now there are many theory’s as to why some powerful people would want to erase our history. And one of those is that it would simply go against evolution, or it might mean that the bible is real and god, the devil does exist. And giants to some are also known as Nephilim. Now if giants did once roam the earth not that long ago there could be other proof other than skeletons. Now the story that I want to cover today happened in China. Not that long ago a news agency in southwestern China published some photos of some really big footprints found in bedrock. And not to long after this report people went to this location to see how big they really were. 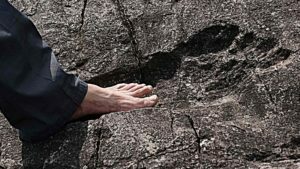 And to their surprise they uncovered that these ancient footprints measured 57 centimeters long, 20 centimeters wide and 3 centimeters deep. So if a human or a human like being was responsible for these tracks he must have been huge, anywhere from 10 to 15 feet tall. And there have been other very similar discovers throughout the world. One of the most famous ones is in South Africa were this truly enormous tack is measured to be 3.5 meters tall and estimated to be 200 million years old. Making some believe that not only did giants once roam the earth but they are actually part of an ancient civilization. And just maybe they are in fact us and overtime we just grew smaller and smaller just like ever other creature that has survived since the last great extinction. But some say they are not us but a cousin of ours like Neanderthals. And some believe that they are fallen angels, Nephilm. Like I said there are many, many theories about ancient giants. Another discover happened in a Nevada where two Bigfoot hunters found a huge hand print inside a cave. Now I have covered this before but the interesting thing about this case is when they went back the hand print was no longer there. So somebody was trying to cover this up. And there are many legends coming from the Native Americans saying that there was once a race of red hair giants that once lived within this region. And at one time in their past they went to war with them. And during a very long battle the natives were able to trap these giants in this very same cave. Then they burnt them alive. And this hand print could have only been made by somebody on fire. Which is extremely interesting and gives some credibility to these ancient legends. And by measuring this hand print it is believed that these giants must have been at least 18 feet tall. Making me wonder, how the heck did the native tribes win this war. One theory is that the population of these red hair 18 foot tall giant beings were very low and they were just naturally dying out finally giving the native Americans the upper hand. And this isn’t the only discovery within this cave. In 1911 two guano miners, yes guano miners David Pugh and James Hart found several sets of enormous bones under 6 feet of bat droppings, but sadly nobody knows where these bones are today. Now these amazing discoveries keep surfacing and if these discoveries are in fact true then the Smithsonian or who ever is behind this massive cover up will not be able to hide are history for too much longer. Because in the end the truth will always surface! « Is This A Picture Of The Loch Ness Monster?